This is not a song but a partial alphabetical list to remember all the things needed for Passover. Khave Rosenblatt learned this from her Bessarabian mother. She ends with the letter “lamed” and leaves out (maybe intentionally?) the word for the letter “yud”. Additionally, Rosenblatt left out here the letter kof for “koyses” but added it on a later version. 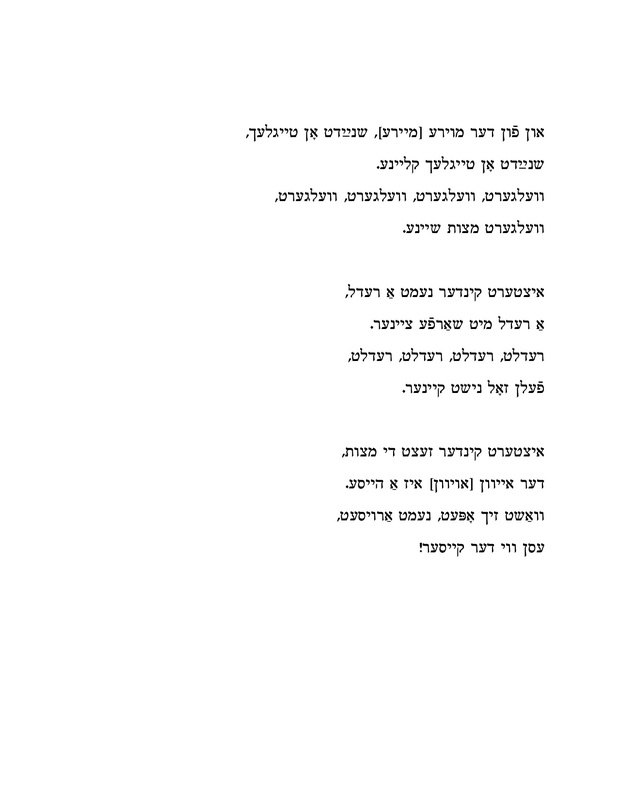 There is a more well-known song “Alef-indikes” that compares the poor man with the rich man, with a rhyme for each letter. (See M. Kipnis 1949 page 199). 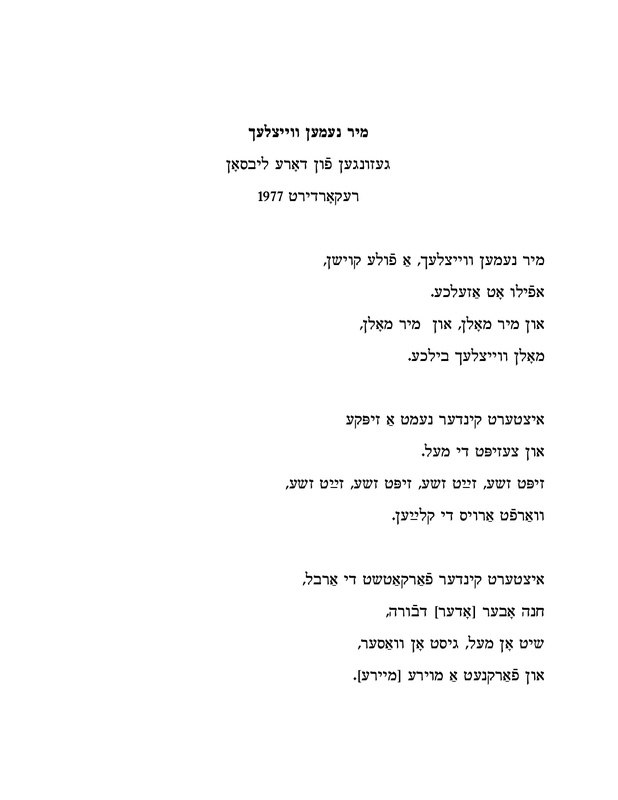 Mir nemen veytslekh is a matso-baking song, sung in a Litvish-Yiddish dialect by the singer Dora Libson. This version was recorded in 1977 by Lionel Libson. Dora is from the Western Ukraine. [See her earlier post in this blog for her biography]. The collective baking of matse during the weeks preceeding Passover was, (and is in Orthodox circles today) a joyous event, and the songs that accompany the event, are playful work songs. For another example listen to Michael Alpert sing Dos lid fun matse bakn on the Lori Cahan-Simon Ensemble‘s CD Songs My Bubbe Should Have Taught Me, Volume One: Passover. The singer sings “moyre” instead of “meyre,” a dialectical hypercorrection. Meyre is the dough of the matse. I was unsure of the words in a couple of places and any corrections or suggestions would be welcome. Sift and strain, sift and strain. un farknet a moyre [meyre]. And from the meyre cut up clumps of dough. Cut up the clumps small. a redl mit sharfe tseyner. a puncher with sharp teeth. And no one should be missing. der eyvn [oyvn] iz a heyser. Let‘s eat them like the emperor.